The Tour de France’s first visit to the UK in seven years is mere months away. Yorkshire’s framebuilders have been getting just as excited as everyone else about the county’s hosting of the Grand Depart. In the first of an occasional series, David Harmon takes a look at the bikes Pennine Cycles have built to celebrate the Tour, including one for Mr Le Tour Yorkshire, Gary Verity. With touch down of the Tour de France on British soil for the first time in seven years just around the corner, host county Yorkshire has got behind the race with a series of festivals, art installations and theatrical productions, all celebrating the arrival of the Grand Boucle. In the last few years, Yorkshire has been at the heart of the handbuilt bicycle renaissance as established builders such as Arthur Caygill, Woodrup, Bob Jackson and Ellis Briggs have been joined by new young companies such as Feather Cycles, Baldwin Titanium and Titchmarsh Cycles. It was inevitable that these craftsmen would join the celebrations. Over the next few weeks road.cc will be dropping in on some of Yorkshire’s constructeurs to check out their spin on the arrival of the Tour in ‘God’s own Country’ and the bikes they are building to mark it, starting with Pennine Cycles of Bradford. Pennine started life as Whitaker and Mapplebeck in 1946. Geoff Whitaker and Johnny Mapplebeck had fallen in love with Italian bikes while posted there during World War 2 and their bikes mixed Italian style with a touch of Yorkshire, reflected in model names such as the ‘Nidderdale’ and the ‘Ingleby’. By 1952 the shop had adopted the name Pennine and frames are still hand built under that name. The imminent arrival of the world’s greatest annual sporting event has prompted the firm to build a series of homage machines reflecting the iconic jerseys of the Tour de France. One of those bikes belongs to the man responsible for the bid to bring the Tour to the county, Gary Verity, Chief Executive for Welcome to Yorkshire. For the last 14 years Pennine has been owned by Paul and Sandra Corcoran. Paul started on the shop floor, working his way up to manager before he and his wife bought the business. 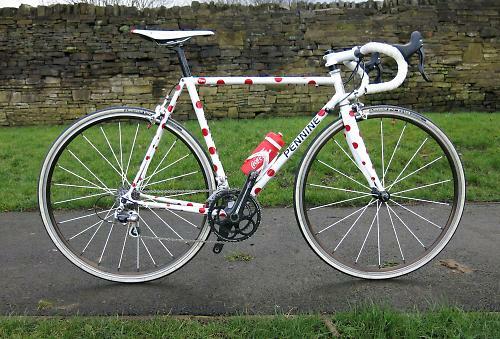 The result is a Columbus-tubed frameset that ticks all the boxes for long rides deep in the Dales around Verity’s home. Each of the main tubes is finished in the colours of the classifications jerseys and the man himself gets out regularly training around his farm near Bedale. Pennine are also producing frames painted up in single jersey colours. Paul’s latest winter bike, again constructed in Columbus Thron, smacks you straight between the eyes in GC Yellow. With relaxed angles and a full set of mudguards Paul’s bike is a mile eater not a crit monster, the paint nicely complemented by the matching stem, saddle and bar tape. Sitting in the shop on our visit was a customer’s polka dot mountain classification bike, built to order in Reynolds 853 sporting neat shot-in seat stays and a tiny white rose — the symbol of Yorkshire — on the top tube. Riding with a dotty or bright yellow bike might not be to everyone’s taste but the passion with which companies like Pennine are embracing the arrival of the Tour de France this summer can’t be faulted. Try spokesmanwheels.co.uk You could easily better the Prime wheels spec for that price and they will be handbuilt. They have stock items on ebay too.